Sea Palling & Waxham Village Hall is one of the best available locally. Hire rates are kept to a minimum to ensure maximum use. The hall has achieved a 5 star rating for hygiene from North Norfolk District Council. The Village Hall has an alcohol licence - beer and wine available for sale at functions, Sundays excluded. To enquire about the Hall please contact either the Chair Clive Preston (telephone 01692 598828) or the Secretary Jane Bird (01692 598464) e-mail: j.bird01@btinternet.com. Otherwise find us on facebook at Sea Palling with Waxham Village Hall. The main fundraising event of the year is our popular annual Fete. 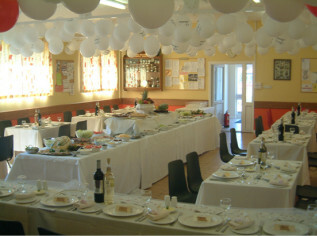 The view of the hall below is of the hall prepared for a wedding by committee members. 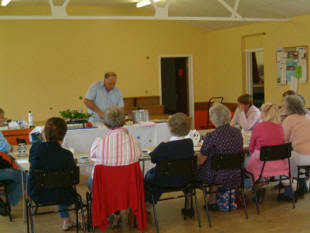 A quiz & supper night is held at the hall every month, except December, mostly on the third Saturday. These nights prove very popular and it is recommended that tables are booked as early as possible. The cost is £8 per person to include a hot and cold three course buffet. You are welcome to bring your own beverages. Telephone 01692 598828 for bookings and enquiries. A highly successful carpet bowls club. New members always welcome. singing in the hall on the 2nd and 4th Monday of the month, 14:00-16:00 £2 per session includes refreshments. Quiz and supper evening: 3rd saturday each month (except December) max 6 per team, £8 per head inc 3 course meal - raffle. Village Yard sales - 3rd Sunday in August 10.00 - 16.00 - will also include Grand Draw. Pitches for sale £5. refreshments available including bacon rolls, BBQ, tea and cakes. Swap a pot: 3rd Sunday October 10.00 - 14.00 - all things garden related - free entry. Courses have included computers, diving, drama and cooking pictured below. 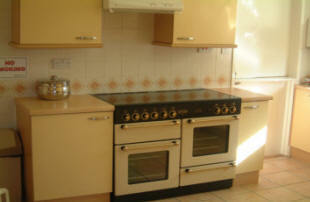 Our modern kitchen is ideal for most catering needs. The hall is licensed to accommodate up to 100 people.